Locke Lamora is just a child when a plague leaves him orphaned on the mean streets of Camorr, a city that "has more gangs than it does foul odors." Lamora quickly masters the tools of the thieving trade -- deception and misdirection -- and eventually becomes something of a legend as the leader of the Gentlemen Bastards, a band of misfit orphans known for their intellect and street savvy. But in a city ruled by ruthless crime lords -- Capa Barsavi, whose shirt buttons are made of victims' teeth; the Duke's mysterious henchman, Spider; a ghostlike executioner named the Gray King, et al. -- Lamora soon finds himself a pawn in a much larger and deadlier game. I’ll be honest – the James Bond, smart gang fantasy thing usually isn’t something I’m that excited about. But boy did I need it. January was actually a really jam-packed month for me – I went through 16 novels, most on the paranormal reality side of the fantasy spectrum. It was a lot, and boy did I need a dose of high fantasy! 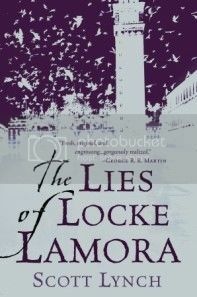 The Lies of Locke Lamora provided it, and boy did it provide it with gusto! I don’t think I’ve ever read a novel where I’ve thought “Man he’s soooooooo screwed! There is NO WAY he’s talking his way out of this one” that many times. One technique of writing is to put your character in the worst situation possible and then sit back and watch while he tries to get out of it, and Lynch has this technique down to an art form. Then again, some people might see this as a bad thing. I’ll admit, there were a few times where I stepped out of the novel and said to myself “There is no way a real person would think of that!” It didn’t matter to me – I kept reading because I wanted to see how he’d fix everything! But I can see how some people would find it distracting. Another thing that didn’t bother me (in fact, I loved it!) but might bother some was the format. This story doesn’t tell you anything unless you absolutely have to know. Basically that means the timeline jumps around quite a bit. I loved it! It meant that Locke stayed very mysterious at the beginning, which fit with the character really well. The switches to flashback were a tiny bit annoying, but only because despite their vital information giving, they meant a longer wait until I found out what happened! Many older posts are currently under reconstruction. Please excuse the inconvenience. Creativity's Corner is dedicated to fostering discussion among a community built around books. I'm so happy you decided to join us! If you have any questions please check out the Tips for New Readers page. Creativity's Corner is NOT accepting any review requests at this time. Thank you for your consideration. Kristilyn (Reading in Winter) on Happy New Year 2014! Design by Paper Wings Design Studio.